This entry was posted on Sunday, December 24th, 2017 at 8:55 am	and is filed under Meri Awaaz Suno. You can follow any responses to this entry through the RSS 2.0 feed. You can leave a response, or trackback from your own site. Thank you my friends for your generous appreciation of my tribute to Rafi saab. It is impossible to capture Rafi’s ingenuity in any prose or poetry. Sorry Yesudas ji I cannot translate the poem in English. Mahesh ji, Syed ji, Muhammad ji, and Nasreen ji I am grateful for your kind words. Thank you all. Long Live Rafi and his melodies! Sorry friends, my Urdu knowledge is near-zero. So I could not understand what the above comments mean. 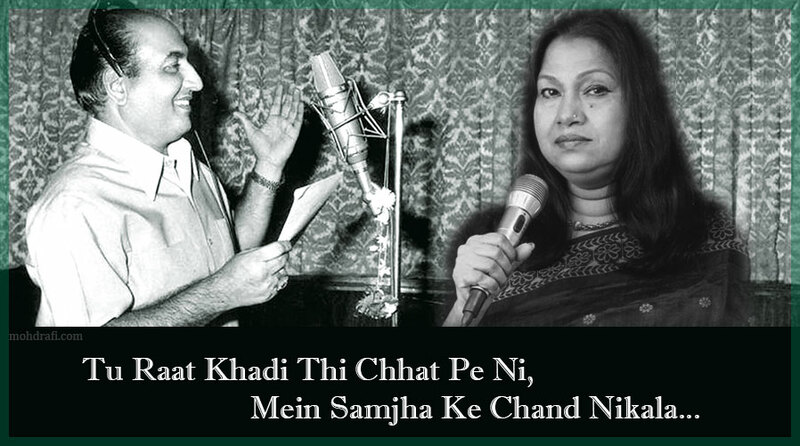 However, I do grasp that the author has poured her heart out on Rafi Saab. Well, this is quite close to being an ultimate tribute to RAFI Saheb. It is a great piece of inventiveness that is probably only possible for someone who knows what he or she really needs to say. I know for sure having followed Rafi Saheb’s songs for more than half a century. He was the only one who could do justice to the genius of such a great variety of music composers and actors of his times.